A solid state relay (SSR) is an alternative to using a classic switch when you want to turn a circuit on or off. The SSR is triggered by an external voltage applied across its control terminal. It has no moving parts and thus can operate much more quickly and last longer than a traditional switch. If it uses infrared light as a contact; the two sides of the relay are photo-coupled. Major factors are convenience, safety and cost. 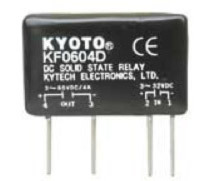 Relays are smaller and less expensive than switches. With a switch you'll also have to run thicker wires (enough to handle 30 - 40 amps) because it requires more voltage than a relay. Think of a relay as a remote, it provides safety by giving you extra distance from the power supply. The wires of an SSR are smaller and of a higher gauge than a switch. SSRs are also faster, smaller and have a longer lifetime than a mechanical relay. They help increase safety since you're dealing with a lesser voltage and amperage, giving you a smaller voltage/amperage controlling a higher voltage/amperage. For much higher voltages an SSR is an excellent alternative when a regular switch cannot be used because of burn out under the current. The diagram below shows how to wire a solid state relay. 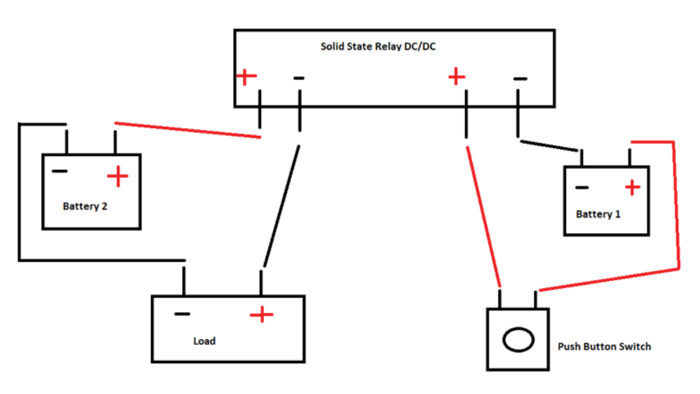 Please note that the diagram refers to DC/DC type solid state relay (SSR). Connect (R) positive terminal to the push button switch. Connect (R) negative terminal to the negative terminal on battery 1. Connect (L) positive terminal to the positive terminal on battery 2. Connect (L) negative terminal to the positive terminal on load. Note that battery one was used as isolation. Connect the negative terminal of battery 1 to the negative terminal of the SSR (R). Connect the positive terminal of battery 1 to the push button switch. Connect one terminal to the positive terminal (R) of the SSR. Connect the second terminal to the positive terminal of battery 1. Connect the positive terminal of the load to the negative terminal (L) of the SSR. Connect the negative terminal of the load to the negative terminal of battery 2. Connect the positive terminal on battery 2 to the positive terminal on the output. Connect the negative terminal on battery 2 to the negative terminal on the load. If you have questions please feel free to contact the Jameco Technical Team at [email protected]. Arnold got his start in Electronics working for Sanmina Corporation, where he learned his way around PC Boards at the component level, as well as learned to solder. He gained experience in the computer industry working as a technician assembling and troubleshooting workstations and servers. Arnold has an A.S and A.A degree from Mission College and then obtained his B.S. in Electrical Engineering from San Jose State University. In his spare time Arnold does Software and Hardware development using various programming languages.